Written by Hawaiian Senator Mazie K. Hirono. Last month, 2,500 people from 97 countries flew to Hawaii–not for vacation, but to address the international crisis facing coral reefs around the world. Participating in the 13th International Coral Reef Symposium, these world leaders, scientists, activists and students issued a powerful call to action to address the growing threat of coral bleaching around the world. Failing to take action now will have increasingly profound consequences in the future because the health of coral reef ecosystems are not only critical for the health of our environment, but also for our economy. And as we celebrate National Coral Week, we have the opportunity to amplify the voices of advocates like Dr. Robert Richmond and Dr. Ruth Gates in Hawaii to ensure these vital ecosystems receive the attention they deserve. Coral reefs are essential to our oceans and environment, especially in island and coastal communities. In my home state of Hawaii, more than 640 square miles of coral reefs surround the main Hawaiian Islands–more than the total landmass of the island of Oahu. Our reefs are home to more than a quarter of the world’s marine life, including thousands of species that are only found in the Islands. Protecting our reefs is not just an environmental issue. It is an economic imperative. When coral reef ecosystems are healthy, they drive a tremendous amount of economic activity. In Hawaii, our reefs generate nearly $800 million for local businesses every year. Worldwide, coral reefs generate more economic activity than any other type of ecosystem. Unfortunately, our coral reefs are under severe stress from coral bleaching and other environmental threats. There have only been three major coral bleaching incidents recorded in history–and two of them occurred in the last two years. These rare events are likely to become only more common as ocean temperatures continue to rise. As an island state, Hawaii is particularly susceptible to the economic impact of coral bleaching. The National Oceanic and Atmospheric Administration found that last year’s bleaching event killed 90 percent of West Hawaii Island coral colonies. We must work together to break this cycle and to promote healthy coral reef ecosystems both in Hawaii and around the world. It has recently been found that approximately a third of the corals in the Great Barrier Reef are also dead or dying as a result of the current bleaching event. Unfortunately, there is a disconnect in Washington between what scientists know and what Congress is willing to do to address this environmental crisis. Too many of my colleagues in Congress deny basic science when making national policy. To them, global warming is a myth, and climate change and the rising temperature and acidity of our oceans have no impact on the lives of everyday Americans. We know this is fundamentally untrue, but we can’t just count on these members coming to their senses. We have to dedicate ourselves to the hard work it will take to educate policymakers and other naysayers to change their views. While there’s much we can do to address this problem, earlier this year I introduced legislation to spark innovation in coral reef health research. My bill would direct federal agencies and the private sector to team up in offering a competitive prize to stimulate innovative solutions to protect our reefs. I’m also working to build consensus in both parties for additional action. For example, I led a bipartisan letter to the Obama Administration to make sure our nation’s leaders are paying attention to the crisis facing our coral reefs, and urge the Administration to take action on new solutions to preserve, sustain, and restore coral reef ecosystems. As a member of the Senate’s Energy and Natural Resources committee, I will continue to be a strong advocate for science-based policies that protect our environment, grow our economy, and address climate change. Protecting our coral reefs requires all of us to put our heads together–scientists, policymakers, technology developers, etc. to create solutions so that future generations can enjoy healthy, vibrant ocean environments. 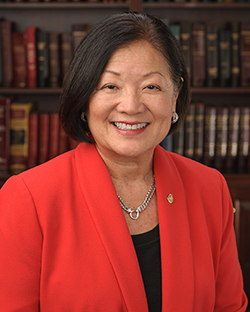 Mazie K. Hirono was elected to the Senate in 2012 and sworn in as Hawaii’s first female senator and the country’s first Asian-American woman senator. Hirono’s priority is to ensure that every American family has the opportunity to work and succeed.